It was well past noon when I woke up and smelled the coffee. Sherry had a small white Krups® electric coffee grinder and a Chemex coffee pot and she made the best coffee. The Chemex was one of those glass coffee pots which is shaped like an hour glass and has a little wooden band around its middle which is held in place by a thin strip of rawhide. Sometimes I think I would not have been with her if her coffee hadn’t been so good. Sherry also made me a tunafish sandwich every day to take with me to work in my taxicab and together with a Thermos® of her great coffee, she packed it all up quite neatly in a paper towel inside an aluminum lunchbox along with a fresh juicy pear and some alfalfa sprouts. Five times a week, I’d pull on my jeans, throw on a T-shirt and slip into my boots and brown leather bomber jacket and bomb down the long steps at 240 DeKalb Avenue in Brooklyn. Then I’d fly down into the subway and hop a fast train to Long Island City and get to the garage at 30-19 Northern Boulevard around three o’clock in the afternoon. That’s when Morris Kapner, The Day Man, would bring in IM-19, the yellow Checker Marathon, I’d be driving each night. Morris, a thin, dried-out looking old fellow with straight, slicked-back white hair and a perpetual look on his face of a man with a bad taste in his mouth, reminded me of Bela Lugosi in civilian clothes. He never looked at me, never spoke to me, never even nodded. He’d pull in, they’d gas it up, and the engine never stopped running. Morris would slowly collect his trip sheet and his coin changer and his cigar box full of cash and go inside the office. As he was coming in, I’d go out the door, get in and drive away. 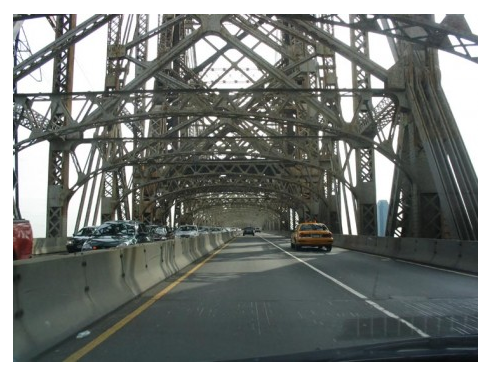 A hundred yards south on Northern Boulevard, I’d take the ramp onto the Queensboro Bridge and step on the gas. When I got to the steel mesh on the bridge the tires made an excited whirring sound and my cab seemed to lift up and float about six inches off the roadway in a giant arc, and I its prisoner, as we hurtled toward the big purple city looming in the distance through the windshield and the steel structure of the bridge and charging toward it, through the swirling thin grey air, as if that taxi was driving herself. And arriving on the other side of the bridge at 59th Street, she graciously slowed down came to her senses and allowed me to take over for the night. But this night was going to be different. I had devised what I thought was a clever and ingenious scheme to make more money in tips. Before I left the apartment, I had seen a little color photo of Sherry from when she was in the second grade. I asked her if I could have it to carry with me in the taxi cab. I think she was genuinely touched at the idea of my carrying around her picture with me and gladly handed it over. I mounted it on a little piece of cardboard and enclosed it in acetate. I picked up a few fares before anyone commented on the photo. He was a businessman in a grey suit who had hailed me and wanted to be taken to LaGuardia Airport. He seemed in a good mood when he got in and we chatted amiably for a few minutes. I think I was turning off the Brooklyn Queens Expressway into the airport when he looked up to see how much the fare was going to be. That’s when he noticed the photo. “Is that your little girl?”, he asked in a friendly, upbeat voice, leaning forward in his seat, while taking out his wallet in anticipation of paying the fare. “How old is she…? He chirpped. He sat back, quiet now… and didn’t say another word. We pulled up to the departure deck, he opened the door and got out. But not before reaching into his pocket and giving me all the change he had. My scheme had worked. I felt a little guilty and I took the picture down. But I kept his money.